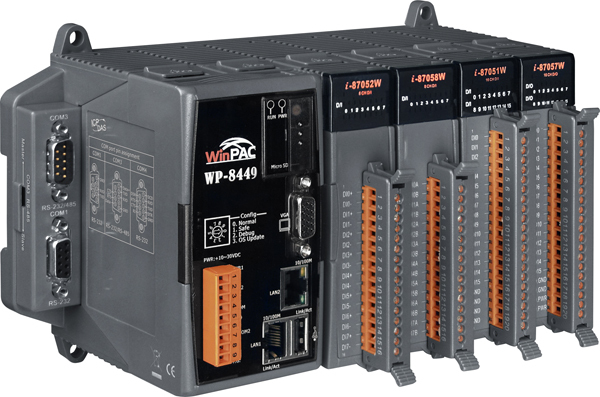 WinPAC-8x49 Series (WP-8149/8449/8849) is the new generation WinCE based InduSoft PAC (Programmable Automation Controller) of ICP DAS. 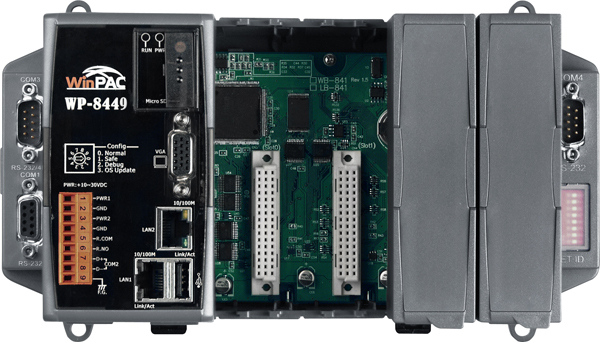 It equips a PXA270 CPU (520MHz) running Windows CE.NET 5.0 Operating System, variant connectivity(10/100 Base-TX dual Ethernet Ports, 2 or 4 RS-232/485 ports, 1 VGA, 1 USB port) and 1/4/8 slots for high performance Parallel-type I/O modules (High Profile I-8K series) and Serial-type I/O modules (Hot-Swap High Profile I-87K I/O modules). Memories come with 128 MB SRAM, 512 KB dual battery backup SRAM, 96 MB FLASH & 16 GB microSD. Redundant support: dual Watchdog Timers, redundant power inputs, dual battery backup SRAM, dual Ethernet Ports. WinPAC-8x47 Series will upgrade your system! 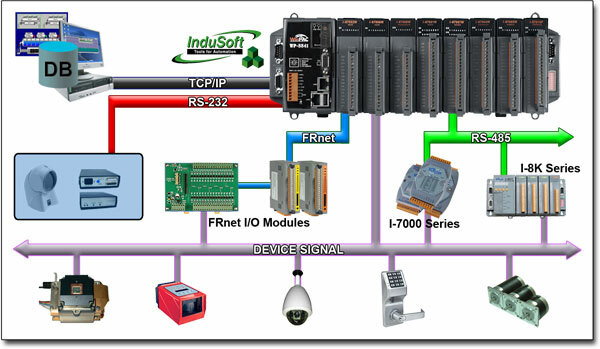 InduSoft Web Studio General Features IWS applications run on microcomputers connected in real-time to machines or processors through WinPAC programmable controllers, remote I/O devices, and other data acquisition equipment. 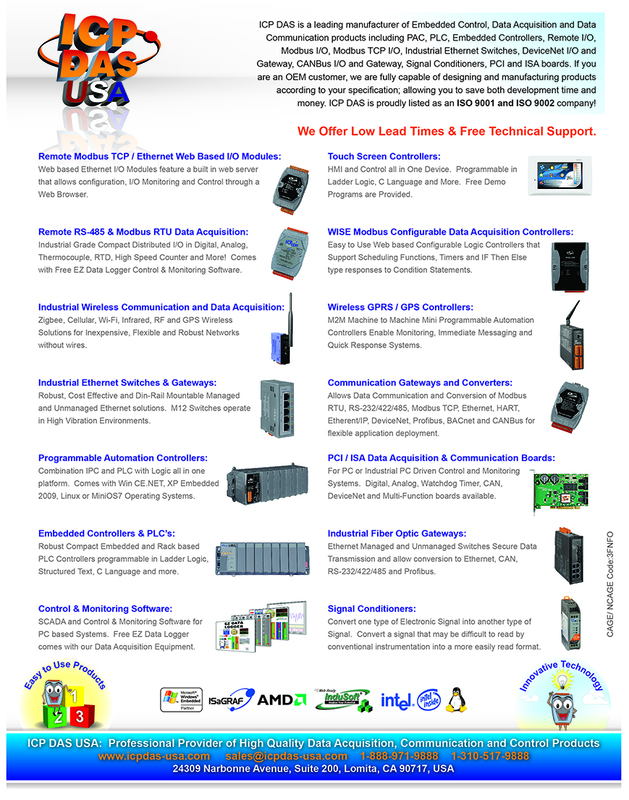 These applications consist of animated operator-interface screens, rollable I/O devices, an application tags database, and optional modules such as alarm monitors, trend charts, recipes, schedulers, and a security system. Communication Protocol. DCON Protocol is provided for ICP DAS embedded controllers or I/O modules.Supports more than 200 Communication drivers such as Siemens, Omron and many more. 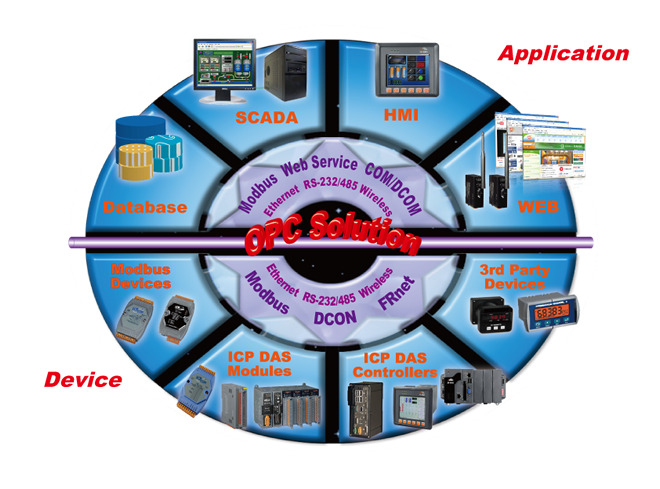 InduSoft supports Modbus / OPC / DDE / TCP/IP / SNMP Client and Server. Easily Access the Database! Supports third-party SQL relational databases such as SQL Server, MS Access, Excel, and Oracle. 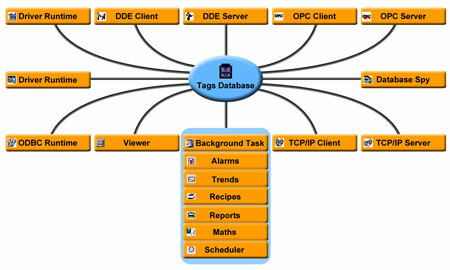 Database connectivety from any platform is supported by IWS or CEView through the unique Studio Database Gateway. Supports a Secondary Database in the modes "Redundancy" or "Store and Forward" to increase the reliability of the system and avoid loss of data. SNMP Protocol is Supported. 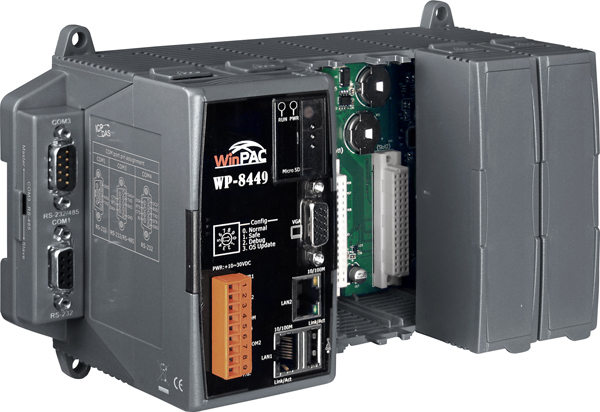 I/O Status of WinPAC can be gathered via Internet by polling or by the inform actively (trap) mode to a remote SNMP manager station.WinPAC controller can be treated as an SNMP gateway to transfer the information including I/O and user-defined data to SNMP manager station. Integrating I/O and Network information in SNMP manager station. Web Thin Clients. A a regular WEB Browser (Internet Explorer) can be used to host the application.Requests online and history data from the Server where InduSoft Web Studio is running, becoming a CLIENT for the data.Provide Multi-level security for applications, including the Internet and Intranet. Useful Package Tools are Provided. ICP DAS has released a package tool for InduSoft. The package tool is integrated with several ActiveX objects and communication tools, including "GSM_ActiveX", "SHM_ActiveX", "COM_ActiveX" and "COM Port Communication Tool"...etc. By using ActiveX objects provided by ICP DAS in InduSoft, user can easily develop multi-function application. Reduce the number of used drivers. To integrate with GSM/GPRS external modem easily. Provides an easy way to exchange data between InduSoft and other Programs. Web HMI Support Web HMI function, PC running Internet Explorer can access to the WP-8x49 via Local Ethernet or Internet or dial Modem, monitoring and control. RS-232 (RxD, TxD, and GND); Non-isolation; Speed: 115200 bps max. RS-485 (D2+, D2-; self-tuner ASIC inside); 2500 VDC isolation for 1 slot controller and 3000 VDC isolation for 4/8 slots controller; Speed: 115200 bps max. Please use NS-205/NS-208 Industrial Ethernet Switch.